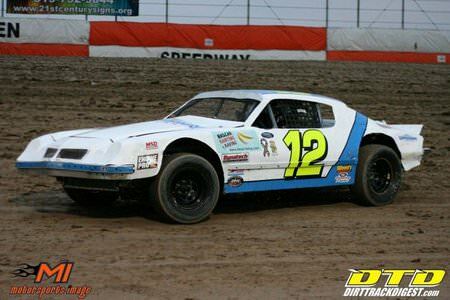 The NASCAR RnR/Expressway Trucks sponsored #12 Thunder Stock of Brad Herron won the Feature Race this past weekend at Ohsweken Speedway. Heading into this race Brad was sitting fourth in the standings, just 48 points out of first. After this race he has now moved to second place in the standings, just 39 points behind the leader. The battle for the top five is close – second to fourth is separated by just three points. Makes you wonder if Brad hadn’t been wrecked the last two weeks if he wouldn’t be sitting at the top of the standings right now. No worries though, there is still lots of racing left in the season for Brad to catch up – provided he isn’t taken out by other’s lack of talent on the track. 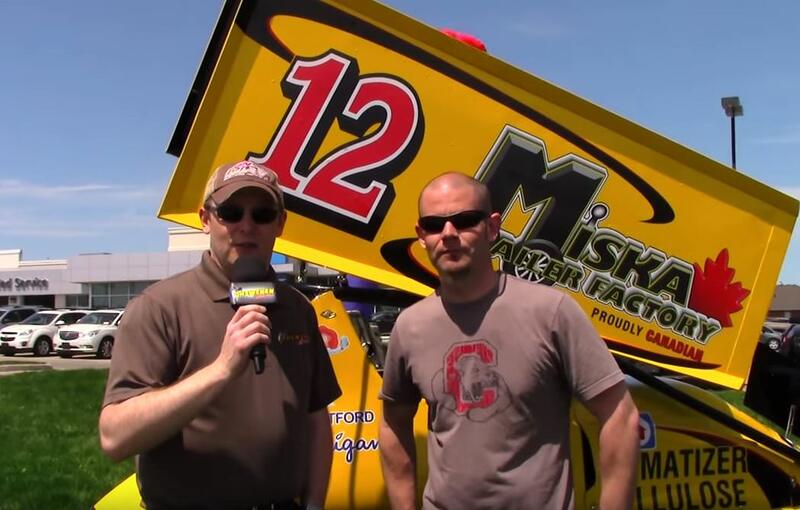 Unfortunately, I didn’t have permission to use this picture at the time of publishing but if you click on the link you’ll see Brad in Victory Lane. Before we get to Friday we need to start with Wednesday night, otherwise known as”Damage Repair Night” – get out the drills, hammers and tape measures. After 3 hrs of beating, measuring, re-measuring and re-measuring again to make sure the rear end was square in the car (along with some not so fine tuning of the sheet metal damage) we were ready to go again. 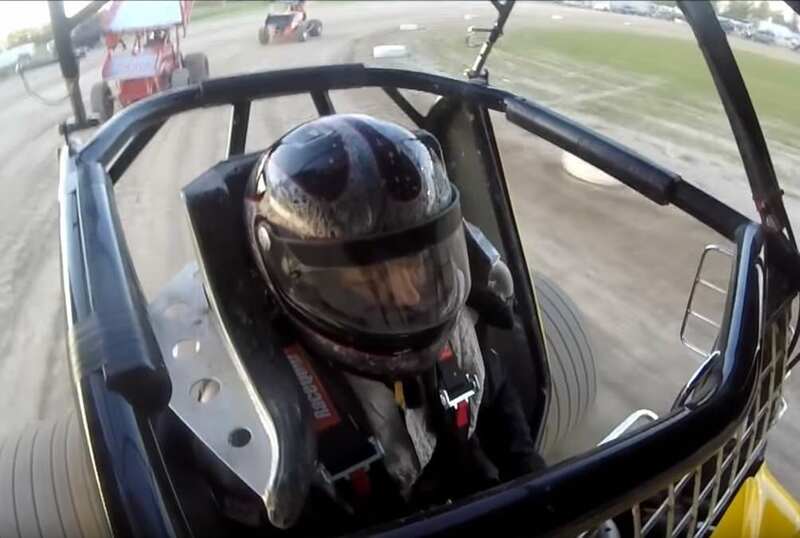 I was still a little unsure of how the car was going to drive at heat race time, where we lined up 4th. After a lap at speed, any doubt of how the car would drive went sailing out the window… it was as good as it’s ever been … maybe a little better. 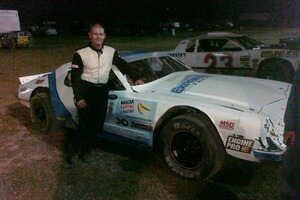 We settled for 3rd in the heat, after getting passed late in the race. Not a big deal though; we were ready for the feature. Just like any other race night we made a slight chassis adjustment, along with air pressure changes and we were ready to the Feature. I haven’t done this for a long time, but at intermission I took a walk around the track to see where it was drying out and where it was still tacky. (Actually, Brad is a bit of a superstitious person, so I expect to see him doing this again next race – Editor). We lined up 13th for the feature and again went straight to the bottom at the start and would not waver from there. It seemed like we broke through traffic quickly and got single file in 3rd place. After a caution bunched the field back up, the race was on! A four car fight for the lead lasted for what seemed like 15 laps and three more cautions. In all honesty, being in the midst of this fight, I wasn’t sure I had enough to get to the lead … so close yet so far you know. But as quickly as that went through my mind, I started picking them off – one on a restart and the rest just chipping away each lap. And with four to go the pass for the lead out of Turn 4, and then a caution came out on the very next lap … (darn) it! That set up a green-white-checker, and we went un-challenged to the checkers. Mission accomplished! Again, I have to thank my crew for thrashing on the car to get it straight again, Expressway Trucks and NASCAR Ranting and Raving for their support along with series sponsors Lighthouse Tatoos and Cairn Croft Best Western. Until next week, hammer down! Congratulations to Herron Racing for their first trip to Victory Lane this year, we hope to see them there a few more times this season!